To keep up to date with all the festival updates and to check on newly added events visit www.wandsworthartsfestival.com. For more information about the arts team or to join its mailing list email arts@wandsworth.gov.uk, call (020) 8871 8711 or write to Arts Team, Staff Yard, Battersea Park, London, SW11 4NJ. Alternatively, you can follow the team on Facebook or Twitter - www.facebook.com/WandsworthArtsTeam and @wandsworth_arts. The Wandsworth Arts Festival and Fringe returns to the borough in less than a month. A launch event is planned to take place on May 3 at a dedicated 'Festival Hub' – situated in an underused public space by the River Wandle and displaying an assortment of weird and wonderful items dredged from the river during clean-ups by the Wandle Trust. Throughout the festival, which runs from May 3 to May 19, art-lovers will be able to pick up programmes from the hub, as well as take part in one of the many day or night events planned at the site, in Wandle Triangle – opposite Southside Shopping Centre. This year's artistic celebration will feature more than 40 events – and new to this year's line up is the Festival Fringe. Under the guidance of a voluntary festival steering committee and festival producer Eleanor Barrett, the Fringe will include a host of community-based events and act as a testing ground for new work. Saturday Nights with The Brick Box at the Festivals Hub – Arts organisation The Brick Box is staging a series of Saturday night headline events from the hub that showcase a range of talent, including local poetry collective Dirty Hands. The Festival Hub will also run a fully licensed bar and have performances from DJs at each event. Fire Garden Magic – Roehampton's Alton Estate will be home to pop-up performances and unexpected installations throughout the festival. Passers-by might discover an inside-out living room on the green by Roehampton Library for example. In addition, local residents of all ages have collaborated with leading street arts organisations, Emergency Exit Arts, to produce their own creative ideas, such as a magical fire garden which promises to entertain visitors on Saturday, May 11. Inspirational Objects: Nature as a designer – This exhibition at Battersea Park's Pump House Gallery asks visitors to see everyday objects that people interact with daily, and often take for granted, in a new light by looking at them in isolation. Described by curator and main contributor, Alison Milner, as a "collection of curiosities", the exhibition also features work by photographer Steve Speller. It runs from May 2 to June 19. The Shimmy – The unique and free event returns at 1pm on May 19. A whole host of artists and organisations will contribute to the Shimmy, which invites people to walk along the riverside between Putney Bridge and Wandsworth Park taking in performances, installations, spoken word recitals and sculptures along the route. It also offers opportunities for all visitors, young and old, to get involved in a variety of workshops and participatory activities. Wandsworth's culture spokesman, Councillor Jonathan Cook, said: "As well as being a fun event for everyone taking part, the festival aims to give residents and visitors from all over London the chance to discover the enormous wealth of culture and creativity Wandsworth has to offer." The Wandsworth Arts Festival and Fringe will be officially launched at the Festival Hub – created by architecture and design practice Assemble – opposite Southside Shopping Centre in Wandle Triangle, Wandsworth High Street, at 4pm on Friday, May 3. The complete arts festival programme can be picked up in borough libraries and from some local businesses. The event is being run with support from local art organisations, schools and other supporters. 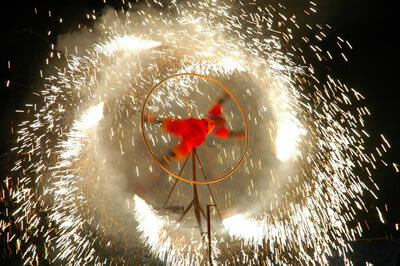 The festival is managed by the council's arts team and funded by Arts Council England with sponsorship from Southside.